Waterloo – CI Financial has announced that it is donating $500,000 to the Lazaridis School of Business and Economics at Wilfrid Laurier University. CI Financial’s investment will support the finance program in the Lazaridis School and establish the CI Financial Finance Lab. 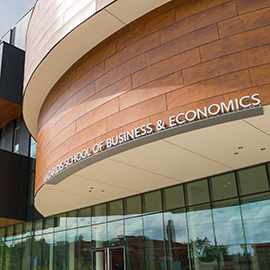 “The Lazaridis School of Business and Economics offers an outstanding education in finance for its students,” said Neal Kerr, president of CI Institutional Asset Management and executive vice-president of CI Investments Inc. “CI has been fortunate to recruit a substantial number of very qualified graduates over the past two decades. We are pleased to partner with Laurier on its exciting vision for preparing Canada’s next generation of financial managers." The company’s donation will fund the construction and operation of the CI Financial Finance Lab, which will provide Laurier students with hands-on experience in securities analysis. Also included in the gift is the software required for a new course on market microstructure. Since its inception in 1965, CI Financial has grown to become one of Canada’s largest investment companies, offering global asset management and wealth management advisory services to more than two million Canadians. The donation is part of Laurier’s Building Canada’s Best Business School fundraising campaign. The campaign is raising funds to support student scholarships, help retain and recruit top faculty, complete the new $103-million Lazaridis Hall, and strengthen the Lazaridis School’s unique, pioneering programming. CI Financial is an independent Canadian company offering global asset management and wealth management advisory services. Since 1965, CI has been driven by a commitment to provide investors and institutions with the highest-quality investments and advice. Today, CI manages more than $180 billion on behalf of its clients. CI Financial’s primary operating companies are CI Investments Inc., Sentry Investments Inc., Assante Wealth Management (Canada) Ltd., Stonegate Private Counsel, Grant Samuel Funds Management Pty Ltd. of Australia, First Asset Investment Management Inc., and BBS Securities Inc. Based in Toronto, CI became a public company in June 1994, and is listed on the Toronto Stock Exchange under the symbol CIX.